1942, 2 January. [from A. I. Gruzdev to S. I. Gruzdeva in Totma] № 35. When I am getting ready, Sonechka, to write to you, there is a desire to say so much, but you begin—and you are incessantly distracted, the conversations of people interfere, and the letter comes out poor. I am very happy that you and Natasha both are in good health, in warmth and relative safety. This calms down me considerably and makes our nomadic life easier. Now we live in tents, since we are stationed on a swamp and zemlyankas cannot be dug. Outside are the January Epiphany frosts, but we, if the flap is not opened for coming in and out, have warmth. When you wash, the hair freezes on your head and breaks off when bent. This is all fluff. The main thing is not in this. Why don’t you number your letters? Do not wait for a letter from me. I am in the German rear. I won’t soon arrive at the front. Strongly I kiss you and Natasha. About the War I will not be writing. Death, vengeance, fanatical brutality, the monstrous and incomprehensible—there are no words which could to any degree even approximately depict the bloody world chaos—the result of a satanic conception don’t be angry at me for the “poor” letters. You want to know how I write to you? My letter—it is not only the mood of that hour in which it is written. To the paper for the hour or two I unbosom what I have experienced, have thought over during the week, sometimes during a longer time; it occurs, that some fragments of letter I bear in myself for a long time, I write one or two letters that are “cold”, while this piece is still stored somewhere deep, deep, I still clarify, I select words, concepts, I refine to myself what I feel. And only after that I write to you. 1942, 21 January. [from A. I. Gruzdev to S. I. Gruzdeva in Totma] № 40. I haven’t written you for more than two weeks, and it was not my fault: I was in the German rear. I went there across the front line, returned by the same not very pleasant way. I’ve come back, and I’m up to my neck in work. I’m alive, I’m in good health, I love you and Natasha. I have not had letters from Ivan Gasparovich for a long time. At the end of November he was alive and well. What is happening to him now, I do not know. Spending nights by a bonfire for two weeks, I burnt my greatcoat in three places. 1942, 26 January. [from A. I. Gruzdev to S. I. Gruzdeva in Totma] № 43. Today we came out to a place where bullets do not fly in and from where mortar and machine-gun shooting is not audible. Immediately on arrival I learned that I was awarded the rank of Lieutenant. All this is good, but best of all is that which the well-known poet wrote about: “Whom shall I call, with whom shall now I share the sorrowful happiness that I’ve remained alive”. You will be astonished not less than I by the information that today I received the parcel you sent on 8 September. But there is absolutely no doubt that you will be cheered by this incomparably less than me. When I took in my hands the things collected and prepared by you, that warmth with which these things were collected and sent blew over me. Not only here where we are, but also in Leningrad, you will seldom find a possessor of a jar of “Rose” jam. I think you yourselves would receive such parcel with pleasure, and I, of course, with not less pleasure would send it to you, but, unfortunately, parcels are not accepted now either from you to me or from me to you. To top it off, as of yesterday we have been set out of the area of direct combat fire, that is, we are not located at the front line. Several days of rest (only from combat, but not from work) is for us a kind of holiday. I feel I want to get to your circle for several minutes, to kiss all of you, to make a lot of noise (imagine, almost all the time here I am merry and noisy) and to battle again, up to the victory. Live merrier, friendlier. Live while you are alive, do live—not vegetate. Happiness is not at all in darned socks and sleek children: this is important, but another is more so: internal vigor, merriment, love. Ah, what a moralist I am. In a word, live friendlier. About what was going on with me in recent days, when I crept through the front line under a shower of bullets, it is not worthwhile to speak, it is not interesting. I kiss you all one after another: Natasha, Sonya, Valya, Vasiliy, Kuzma and all Valya’s children. Up until now I live by your parcel. Not in the material sense, but in the spiritual sense. I already told you once that material things somehow act on me in such a way that greatly brings me closer to the person, they revive memories about him. Recently re-reading your letters, I decided to send to you some of them, which are the most interesting and dear to me, so that you can preserve them. Here I either lose them or wear them out, and I ache for them so my heart pains. 1942, 1 February. [from A. I. Gruzdev to S. I. Gruzdeva in Totma] № 44. We are fighting again and fighting severely. I go to the front line daily. Dear Sonechka and darling Natasha. I am writing an answer to your 2nd letter of 16 December ’41. A few words about myself I’m not getting on too well the health is not too bad but starvation shows something different the legs have swollen and now the face the arms too everything collected [for] my 70th birthday will be taken by starvation everything was appropriate when on car[ds] but certainly my reserves were gone soon And [at] present 400 gr [400 grams (14.1 oz) of bread per 24 hour period] water and that’s all on the basis of this I kind of think that you kick the bu[cket] not seeing how but it can’t be helped it’s a pity that in the scattering And you dear Sonechka tell Natasha that her grandma and her granddad loved her a lot. Dear Sonechka and darling Natasha it is very hard for me to live I’m 70 years old and starvation is going to cut me off, I work 2 hours in the depot although the tram. [streetcars] do not run, there is no water, no light. Hell. I completely entrusted my life and death to Anna Ionovna Delyukin [Delyukina, a neighbor living in another apartment of the same building] gave her my car[ds], with great difficulty I was able to entreat her to take food on card [cards] although they give nothing. 1942, 4 February. 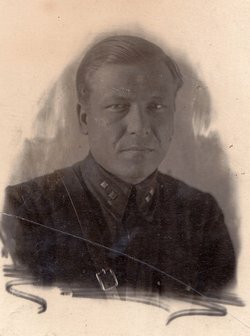 [from A. I. Gruzdev to S. I. Gruzdeva in Totma] № 45. 4 hours 00 minutes. You will be surprised, probably, dear, on reading a letter written in ink . Do not be surprised, do not be worried. Everything is in complete order. We fight fairly persistently, and now I am only 1 1/2 km [1 mile] from the front line. But we’ve been lucky. For the first time in the last two months we’ve gotten into a good blindage. I almost don’t live in it, however, being constantly on the move; I live predominantly on the front, but now I’ve returned from there and am writing you. You are thus far happy, dear: your love protects me, although it sometimes seems that nothing can protect here. The letters I write you are poor: there is no time, I am tired and a little coarsened. You forgive me for this. You are not receiving letters from me now, since from 4 through 22 or 23 I did not write you. Do not worry at such intervals. If there are no letters, this is not so bad, actually. I already wrote you that if anything happens, they won’t keep you in ignorance. I am a rare old-timer in the division, and I am known by many. In all cases they will inform you about me, but—I’m sure—I’ll will still inform you about me myself. This is better. I will go and have a nap, I’m feeling very sleepy. [Continuation written in pencil] I’ve had a good sleep for 4 nights spent without sleep. In my life everything is as before. 1942, 11 February. [from A. I. Gruzdev to S. I. Gruzdeva in Totma] № 51. I, my wee girl, began somehow to be somewhat out of sorts. My feet swell in recent days after walking in my wet valenki, and furthermore I myself have a cold—I cough agonizingly. The situation at the front is serious enough. Often, remaining alone, especially in the depth of night, when everyone is sleeping, I take out those photographs of you and Natasha that I have here, look at them for a long time and very quietly kiss them. Do live, dears, cling to life, struggle for it. Also tell Valya about this. Life in our time is not given easily. 1942, 16 February. [from A. I. Gruzdev to S. I. Gruzdeva in Totma] № 52. Residents of Leningrad have endured a lot and their difficulties as yet are not finished. You will never see many of them again, and the losses the residents of Leningrad have suffered were not from the bombings but from the blockade. My desire is to say to you again: “Be courageous and do not fall in spirit due to any blows of fate.” Yesterday I sent Ivan Gasparovich a parcel and I will hear from him about 22.Feb.42. I have no grounds at all for voicing gloomy assumptions concerning him, but it is not secret to anybody in what difficult conditions the residents of Leningrad are. Ivan Gasparovich until most recently endured magnificently. As far as I know, until quite recently he worked at his job. And this is amazing —after all, he is seventy years old. In the next few days there will much combat work. To see you, I guess, there will be no chance for a long time. If only there were a chance at some time!!! We will believe: we must believe. 1942, 21 February. [from A. I. Gruzdev to S. I. Gruzdeva in Totma] № 53. It is very sad that you will not get one of my letters in which I answered your question: what I am doing on this frosty winter night. I wrote it in minus 40-degree [minus 40ºF] temperatures, in the forest, sitting by a bonfire. The letter was sent through the line of the German front and perished together with the person who was carrying it. I, dear, now almost constantly sing one line of the mournful and sad gypsy romance: “On this night, with the moon, in a strange distant land, / Dear friend, tender friend, you remember me”… Write me until you receive any piece of news about me. While you do not have it, write without ceasing. 1942, 24 February. [from A. I. Gruzdev to S. I. Gruzdeva in Totma] № 54. As before, I am very busy. At nights I am waked up at least 5 times, and it’s all right—I jump up like a bottle cork, and work. Will you recognize me? The situation of Ivan Gasparovich is rather difficult. Today the commander who had dropped by to visit him arrived from Leningrad. He indicates that I. G. is sick and extremely weakened from starvation. According to I. G. himself, he is “fallen in spirit” and is extremely concerned about what to do with his and our things. I cannot seriously help him, and his situation already arouses fear for his life. All this, my dear wee girl, is very hard, but, Sonya, one way or another we understand that man comes unavoidably to his end. This will happen to your dad, to me, to you, to Natasha, and, in the length of time, to her children. But as to the things and even as to our library, it is necessary to forget about them. If we will be living—there will be all, but after death one needs nothing. Take care of yourself and of Natasha, my happiness—this is all I can say. You can remain with our little daughter by yourself, without all kinds of things, without means of support, but you have a good, lucid mind, and for you I hope. We are battling persistently to the utmost. These are the initial lines of Sergey Yesenin’s (1895–1925) poem “Soviet Russia”, written in 1924: “That hurricane’s over. Few of us survived. / Many friends are absent at today’s call-over. / I’ve come again to the orphaned land, / From which I’ve been away eight years. / Whom shall I call? With whom shall now I share / The sorrowful happiness that I’ve remained alive?..” Yesenin was a forbidden poet from the 1930s to 1957: his books were withdrawn from libraries, for reading them people were expelled from the Komsomol and put in prison during the years of Stalin’s repressions. But the poems were copied by hand and secretly shared. This explains why our father, citing Yesenin’s lines by heart, calls the poet “well-known”, but does not indicate his name and does not give any comments: Mama, too, knew both the verses and their author. Jam made of rose petals; such jam sometimes was sold in food stores before and after the War. All letters from the front of the period of severe battles December 1941 – January 1942 were written with a pencil.